Disclaimer: The Creta was purchased by my family about 2 years ago and hence I wouldn't be able to pen down each point in detail. Apologies for the same. Also, please excuse some of the low quality images which were taken from my spare mobile. Every petrolhead or enthusiast has a few of these moments in their life, when they are excited to the core as they plan to buy a new vehicle. While a majority of people buy a vehicle with the aim of moving from A to B, our motives, interests and passion goes much beyond that. In a similar way, my excitement levels shot through the roof when my parents told me they were planning to buy a new car. Through the initial process, we had healthy debates and discussions over the budget, segment, time-frame to buy the vehicle and what not. It was around this time that I realized our Type-II Honda City would eventually make way for the new car as it was almost 15 years old (the WagonR too would have to be replaced a few more years later). I was a bit disappointed as the City would be leaving the garage. What type of car next? 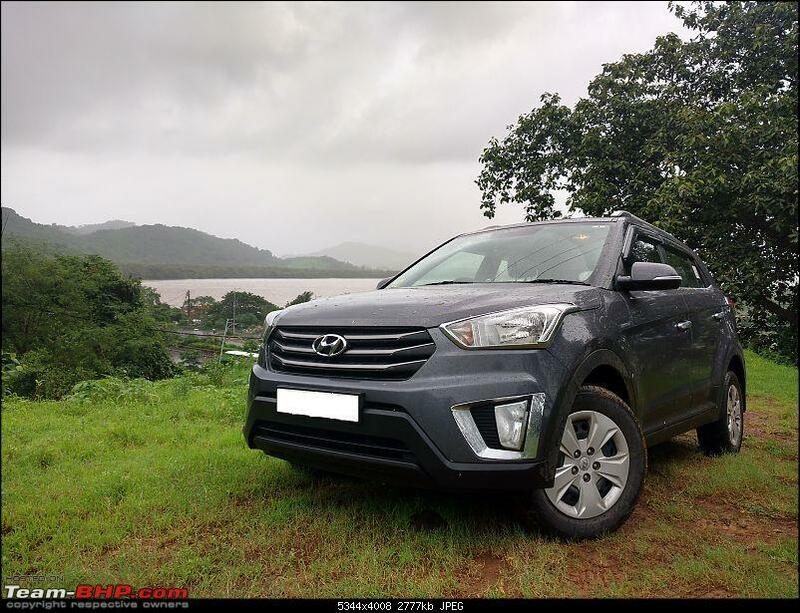 We took nearly a year before coming to a conclusion on what type of car, having tested various models in each segment ranging from a Renault Kwid to the Toyota Fortuner. In the end, we decided we needed something with SUV traits but compact enough to drive in the city as well. The car should have a fairly good ground clearance (coming from the multiple heart wrenching occasions of scraping the City on the smallest of speed breakers) and comfortably seat five people. Features such as a touchscreen infotainment system, climate control, etc. were secondary. Diesel engine and decent fuel efficiency were a must. After finalizing on the compact SUV segment, we shortlisted a few vehicles such as the Maruti Suzuki Vitara Brezza, Ford EcoSport, Hyundai Creta and the Renault Duster. We began our search for the next car by visiting the Navnit Motors owned Maruti showroom located on Ghodbunder Road in Thane. Upon arrival, we were quickly greeted by the receptionist who asked us which car we were interested in. Once we told her we were thinking of the Vitara Brezza, she assigned a Sales Advisor (SA) to us. While my parents went ahead to see the display vehicle, i headed out with another member of the showroom to check the exchange value of my WagonR. A few questions and a short spin later, we were back in the showroom as my parents discussed the price and variant details with the SA. The price quoted for the WagonR was a bit lower than our expectations but it was fine since we were not so keen on selling the WagonR that soon anyway. We later requested the salesperson for a test-drive to which he replied saying that the vehicle had gone for a test drive to another showroom of theirs (on a Sunday!). My father was a bit irritated as he had specifically asked if the car would be available for a test-drive when he called them the previous day. Dejected, we left from the showroom with the spec sheet and prices, while the SA promised us a test-drive in the next few days. We followed up on two occasions later and even waited for a week post the calls, but there was no update whatsoever.. My father was angry as this was the treatment given to us even after knowing that we had bought the WagonR from the very same dealer. The Brezza was chucked from the list post this worthless effort. We called up Satyam Ford located on Ghodbunder Road and the person on call said the car was available for a test drive. We showed up soon after and as we waited for the SA to be assigned, I set my eyes on the beautiful Black coloured Mustang sitting on the showroom floor while my mother checked out the Endeavour. A few minutes later, the SA is assigned and we go ahead to see the EcoSport. I personally didn't quite like the design, it was pretty okay-ish for me. Neither ugly, nor beautiful, something that i could just about live with. After checking out the display vehicle, the SA shared the spec sheet and the price list with us, with even the base variant of the model seeming to be a stretch for our budget. Another down-side (a big negative point for my dad) was the side-way opening tail-gate which could occasionally pose a problem while loading and unloading stuff from the boot due to space crunch in my society. The Ecosport was still in the competition nonetheless, as my father liked the car post the test-drive. The Renault showroom is quite close from the Ford showroom, barely a few hundred metres apart (although on the opposite side of the road). 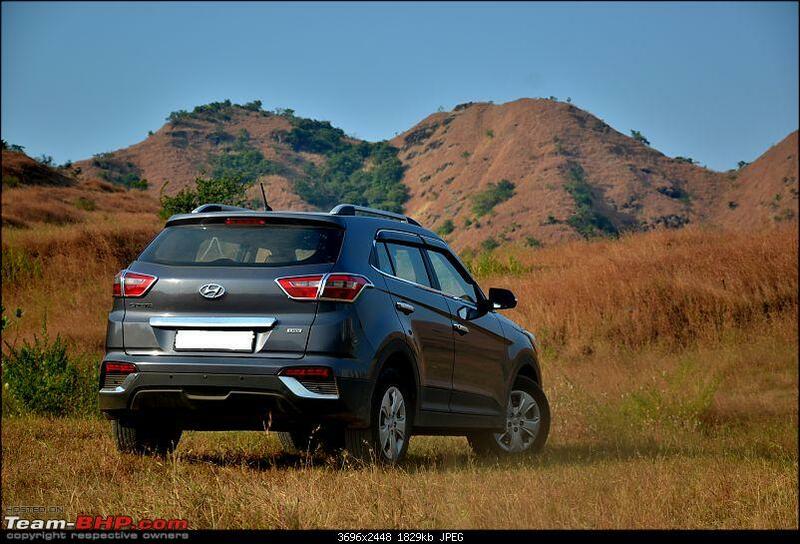 We went there immediately after testing the EcoSport so that we could get a better idea between both the cars. My father and I liked the car as we drove it, but the bare-bone and dull interiors (no offense to any Duster owners whatsoever) were a big put-off. Add to the fact that the company's sales and service was a hit or miss (at least in my area), sealed the fate that the Duster definitely wouldn't be coming home. 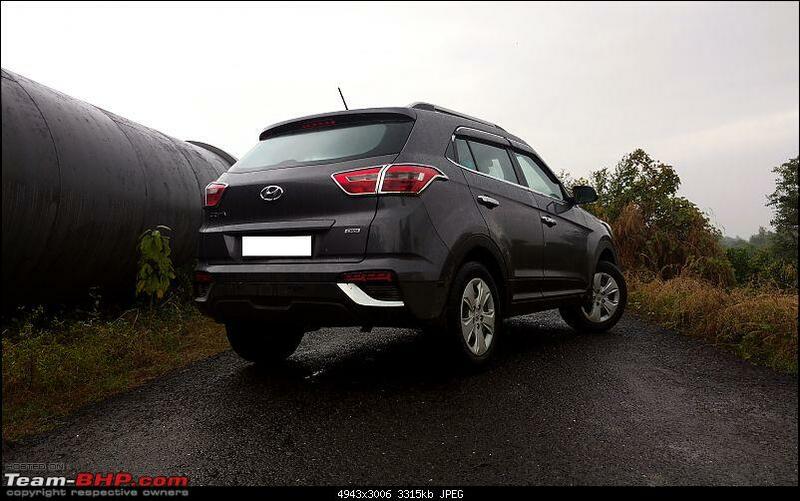 I regularly saw a number of Creta's on the road and was always curious to find out why this car sold so much. 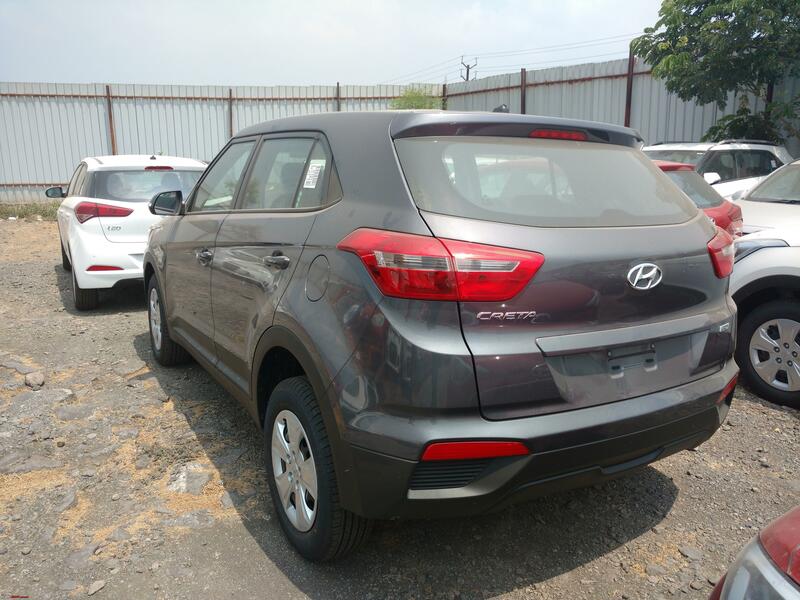 We had two Hyundai dealers in the city at the time, including Modi Hyundai and Shreenath Hyundai. 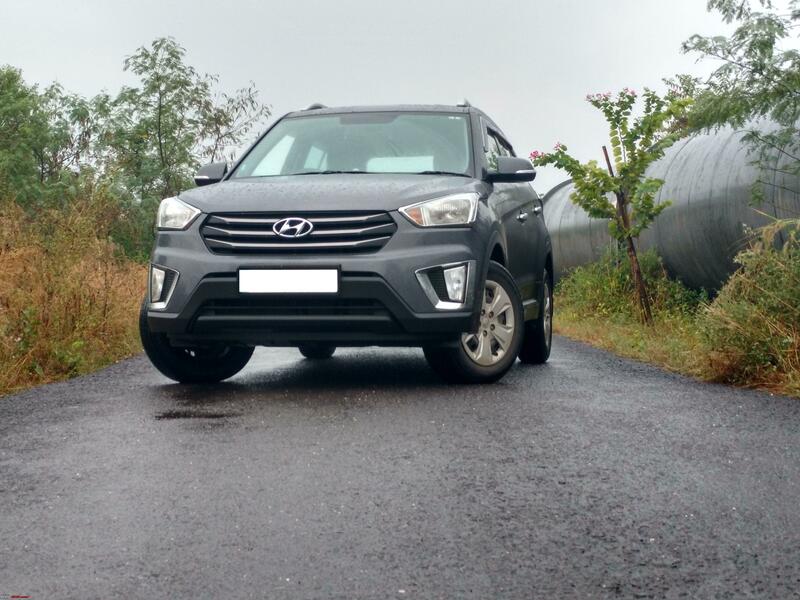 As my father was out of town, me and my mother decided to take a test-drive of the Creta. This time though, we called up Modi Hyundai and requested them for the test drive vehicle to be brought home as mom didn't want to go half way across the city on a weekend. The dealer promptly replied by saying the TD vehicle would be made available for us soon. We got a call later that evening saying the car would be on it's way soon. 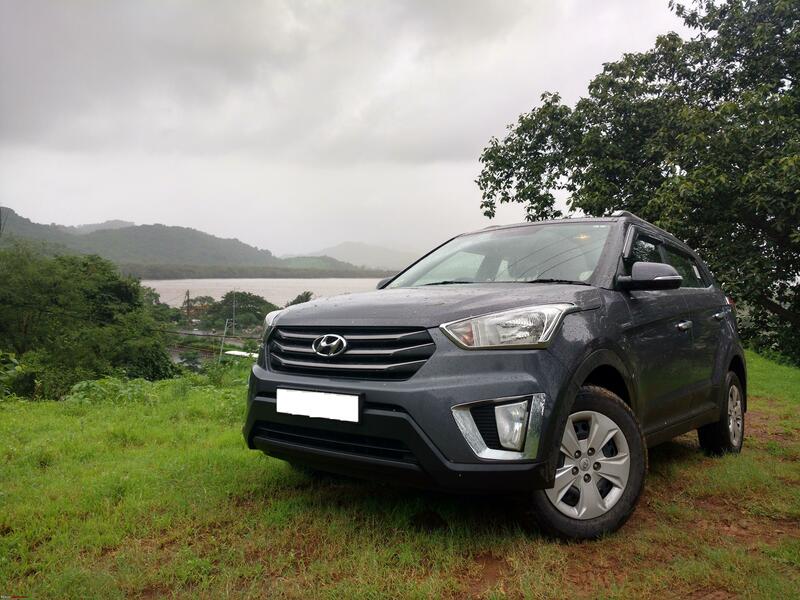 The TD vehicle was the 1.6-litre variant as the SA told us the 1.4 variant is not available as a TD vehicle anywhere in the country (potential Creta 1.4D owners can now try this variant from the Zoomcar fleet if needed though). Although a bit dejected, there was nothing much I could do and hence carried on with the test-drive. I took it through the regular stretches where I usually go for a drive as I knew each pothole and speed-breaker by heart. This would also help me understand the car better. Me and my mother both ended up giving a thumbs-up to the car. The SA shared the spec sheet and price list before departing and we told her we would get back to her for another TD in a few days. 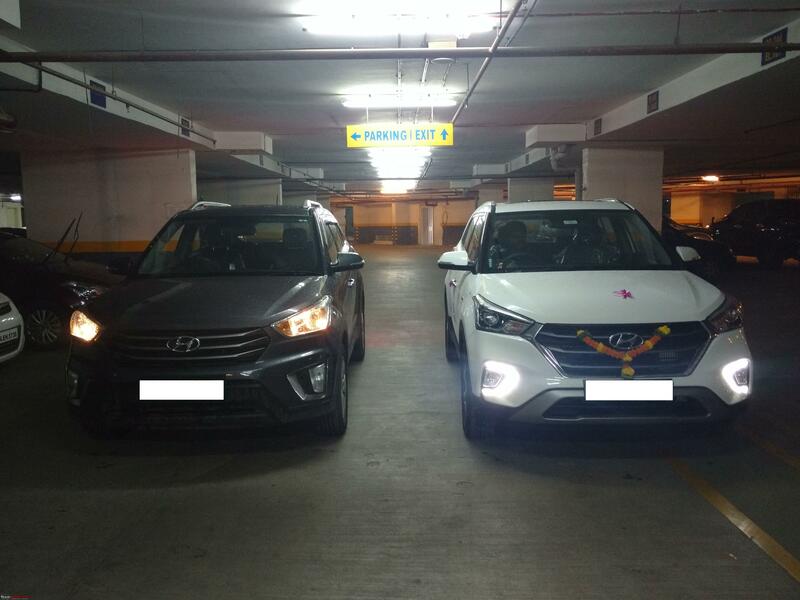 About a week later, my father and i walked into the other dealership (Shreenath Hyundai), which is also co-incidentally located on Ghodbunder Road itself. We were greeted by the SA who explained all the features and details of the Creta to to my father and a small test-drive later, my father asked for the price list before promising to get back soon. 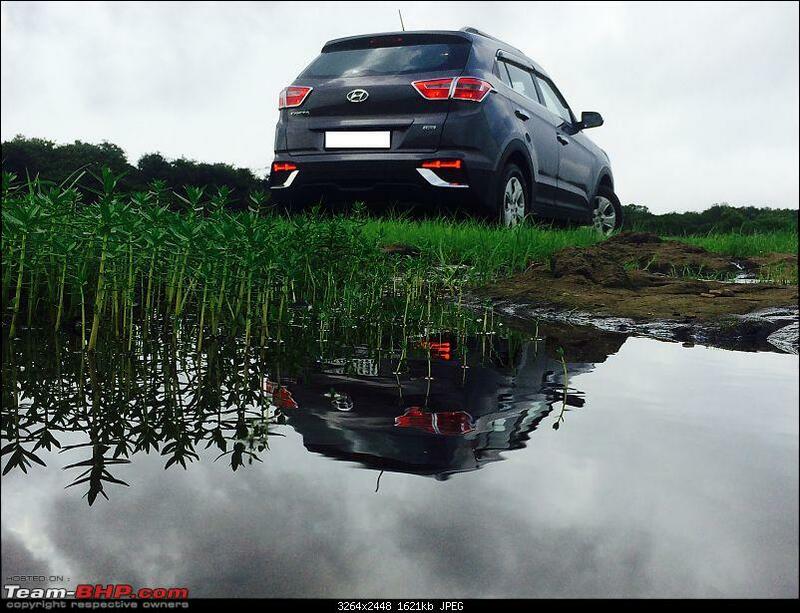 After having another round of discussions, we were keen on finalizing the Creta but the question was, which dealer to buy it from? Before deciding on the dealer, we had to decide on the colour and variant. The variant bit was quite easy due to the budget factor and the 1.4 (diesel) E+ variant was our choice. We also had a lengthy discussion at home on which colour we would want the car in. The Silver paintjob was the first option to be chucked as both our previous vehicles (City and WagonR) were in the same shade. While the Black and White colours were omitted due to the issue in maintaining them, the Red and Chocolate-ish colours were given a miss as they were a bit too rich and a little weird respectively. That left us with just two options, Mystic Blue and Stardust Grey, both of which were a rare sight on the roads at the time. 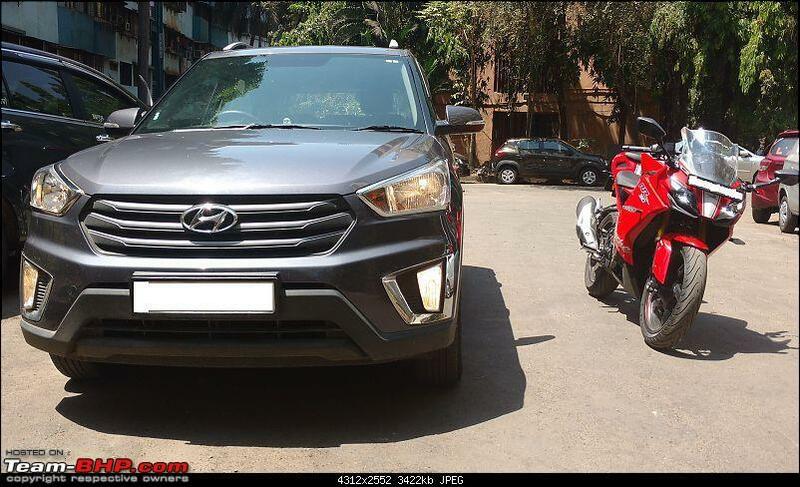 Through the next few days, we did luckily manage to see both the shades on the Creta and the Mystic Blue seemed to be a bit more dull (and rare in numbers) when compared to the Stardust Grey paintjob. At the end, Startdust Grey was the winner. 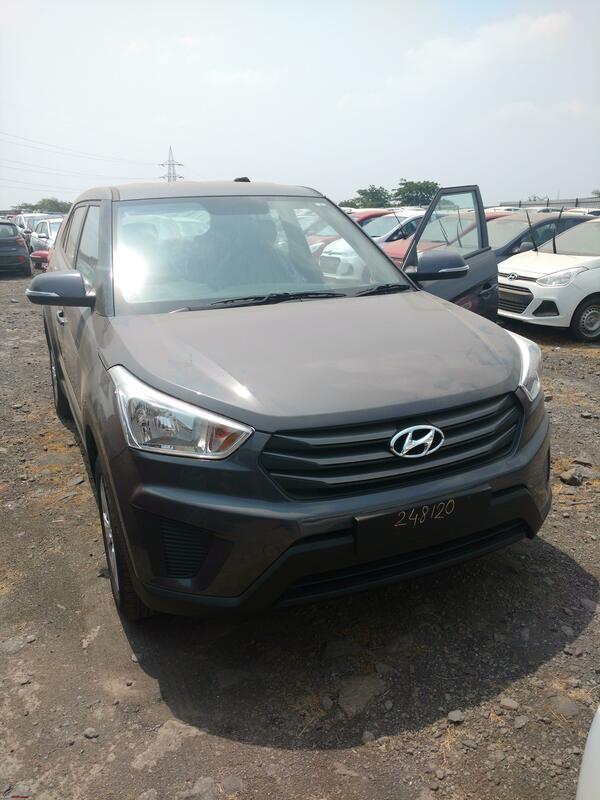 While Modi Hyundai was an established Hyundai showroom having been in the city for quite some time, Shreenath Hyundai was a fairly new dealer in the area. My father decided to approach both the dealers and ask them for the best discounts they could give. 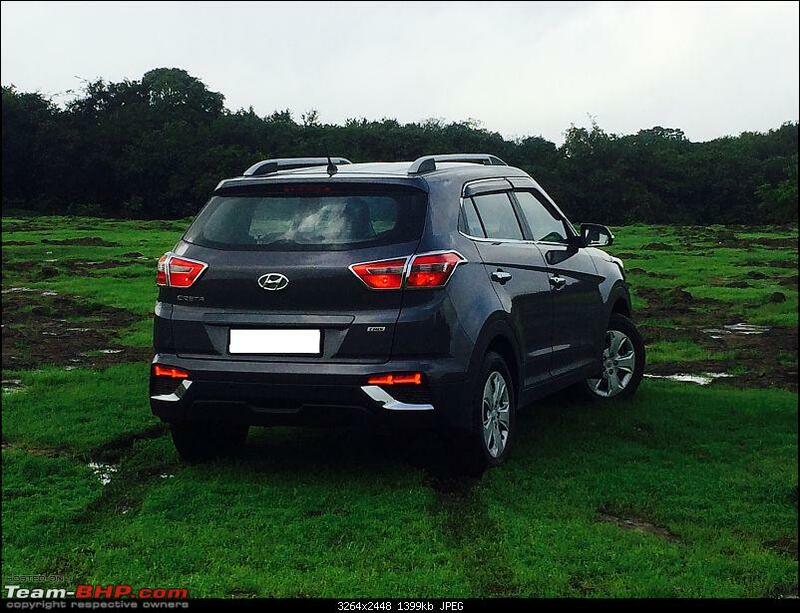 We would then buy the Creta based on the lowest quote from either of the dealers. 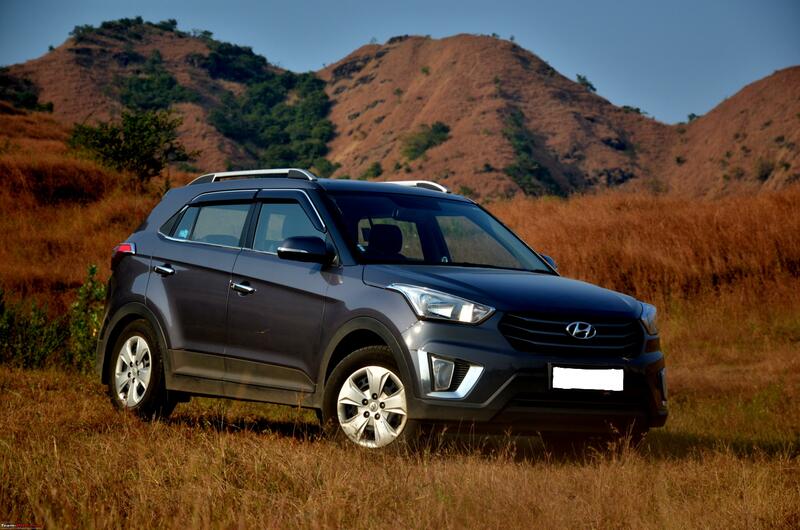 The price list stated the cost of the Creta as INR 11.40 lakh (On-Road, Thane). 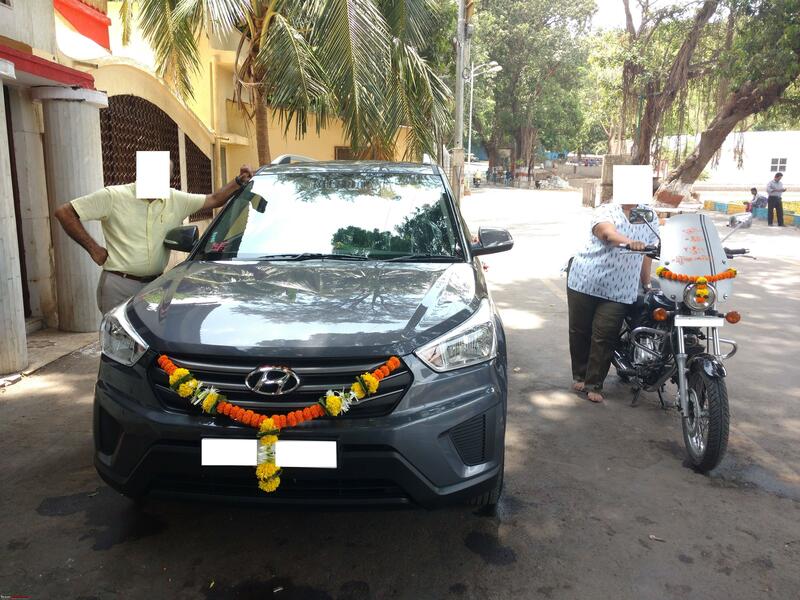 My father managed to get a discounted price of INR 11.20 lakh from Shreenath Hyundai while Modi Hyundai refused to give him any discount citing a long waiting and a good sales record. 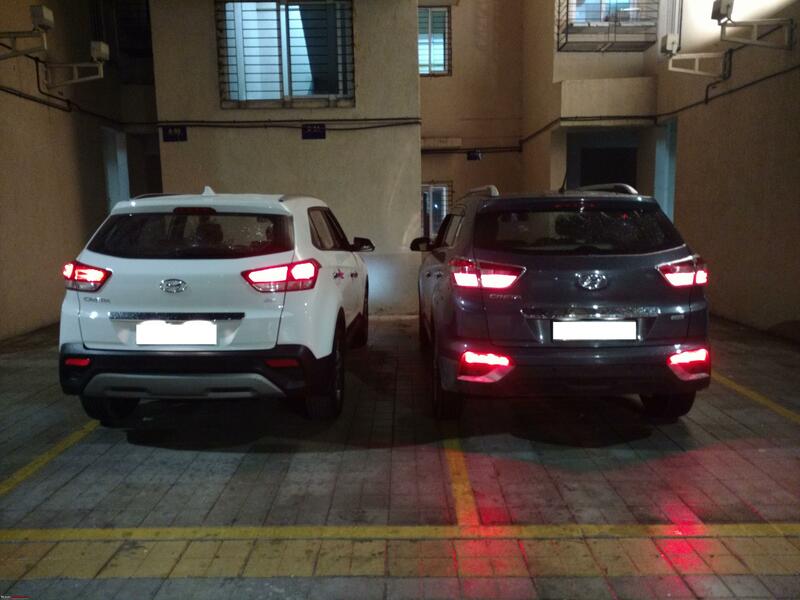 The next day, my father was busy with office related work and had put off the decision to finalize the buying process by a day or two when I asked him if I could talk to the SA at Modi Hyundai since I was the one who initiated the call with this dealer. My father gave me two days for the same and trust me, it was interesting as well as fun negotiating for my next new car. 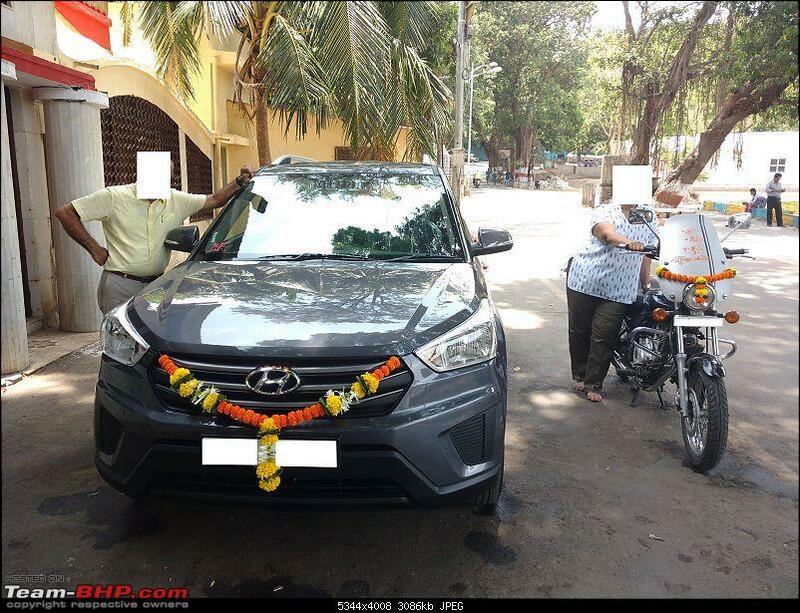 I called up the SA from Modi Hyundai and told him that my father had inquired with Shreenath Hyundai and they were ready to give the car for INR 11.20 lakh and if he didn't give me a better deal, we would not be buying the car from him. A small telephonic discussion later, he gives me a deal of INR 10.90 lakh. I tell him that I will get back to him after talking to my father. After talking to my father about the same, instead of finalizing the deal with Modi Hyundai, he shares the number of the SA from Shreenath Hyundai to haggle with him for further discounts. The SA refused to negotiate on call and asked us to come to the showroom. We went to the showroom the next morning and he offered us a final deal of INR 10.70 lakh, no more discounts or freebies whatsoever. Again, we told him we would get back in a day or two. The same afternoon, we visit Modi Hyundai and my father meets the SA who I was negotiating with. He begins by asking the SA why he wasn't offered any discount when he had asked for it earlier. I understand the helplessness of the SA by now and tell him that Shreenath Hyundai is offering us a deal of INR 10.70 lakh and if he can do any better, we make the booking right away. The SA sits and discusses a few freebies and a little discount with us, and we reach to a conclusion of the final deal of INR 10.60 lakh as well as freebies including a 3M under-body anti-rust coat, teflon coating and roof rails (yes, the E+ diesel doesn't get it as standard, although the E+ petrol does). 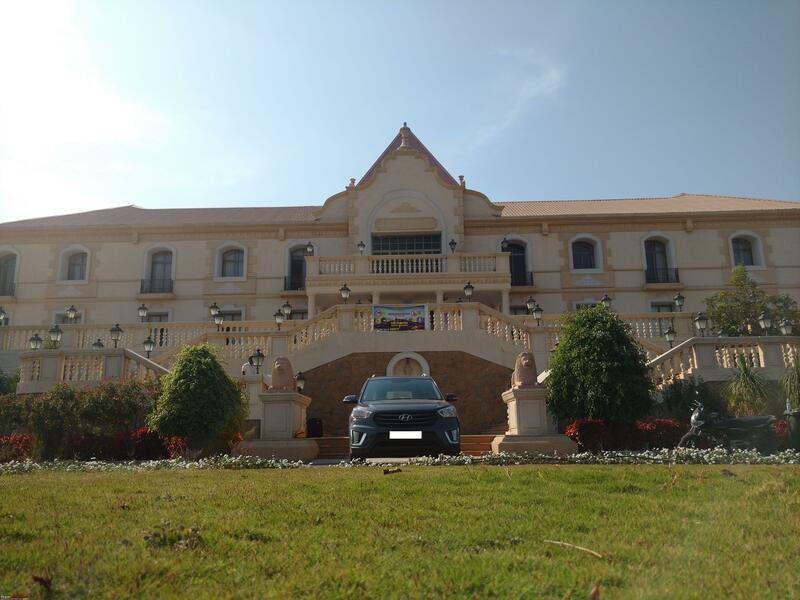 The deal is sealed and we book the car against an amount of INR 5000. After the booking was made, we inquired regarding the waiting period of the car which was quoted as two weeks by the SA. He added that our car has been booked in a new lot and will be dispatched in a week following which it will take another week until it arrives in the city. I call the SA next week and confirm that the order for our new car has been placed and the lot for his dealership has been shipped from the factory. About five days later, I get a call that the car has arrived at the yard and I can do the PDI of the same as requested earlier. 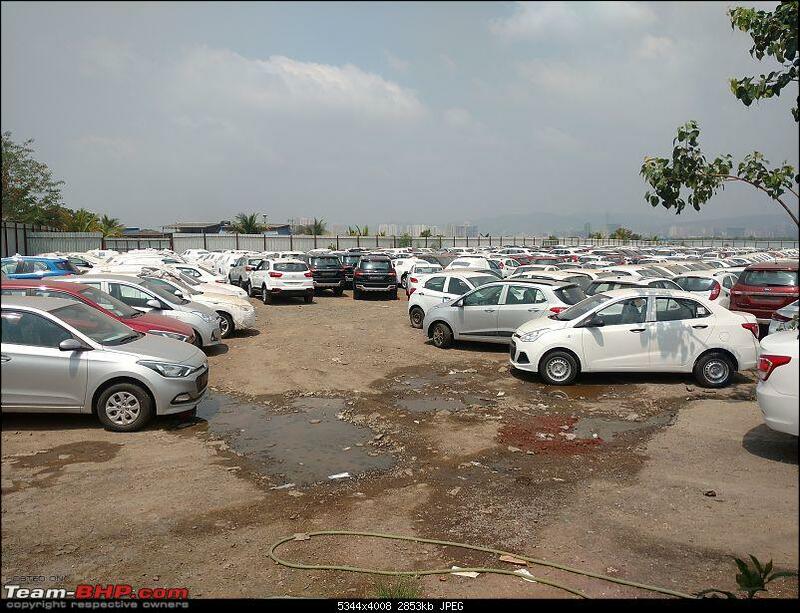 After a little co-ordination for the stockyard visit and VIN details, I head towards the Nashik highway where the cars are stocked. 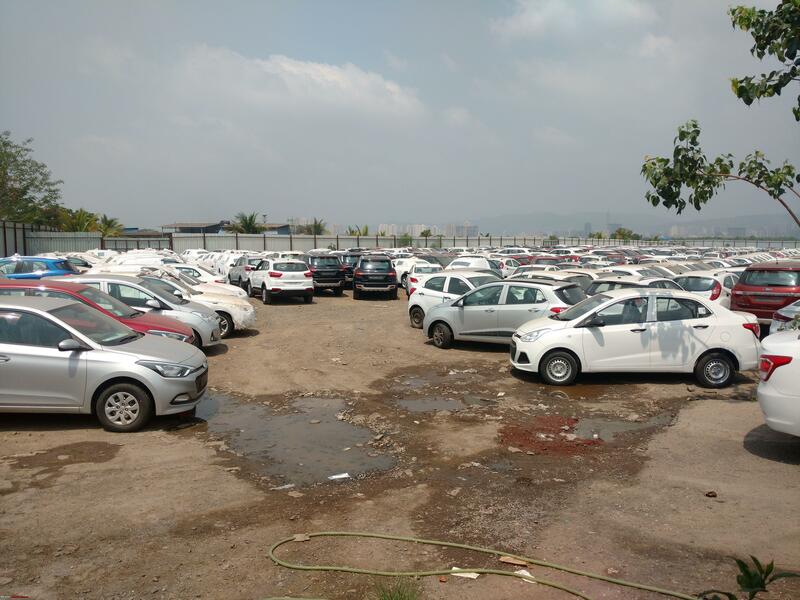 Me and my father enter the yard and witness a sea of Hyundai vehicles as well as a few Audi vehicles too (yes, the dealer also has an Audi showroom). We share the VIN details with the officials at the yard who find our car after a quick search. We then proceed with the Team-BHP PDI checklist in my mobile and begin the process. The car passes the PDI without any issues and we give a go-ahead to the dealer for the registration, which would take another 4-5 days. In the next few days, my father receives messages for the insurance registration and car registration number as well. 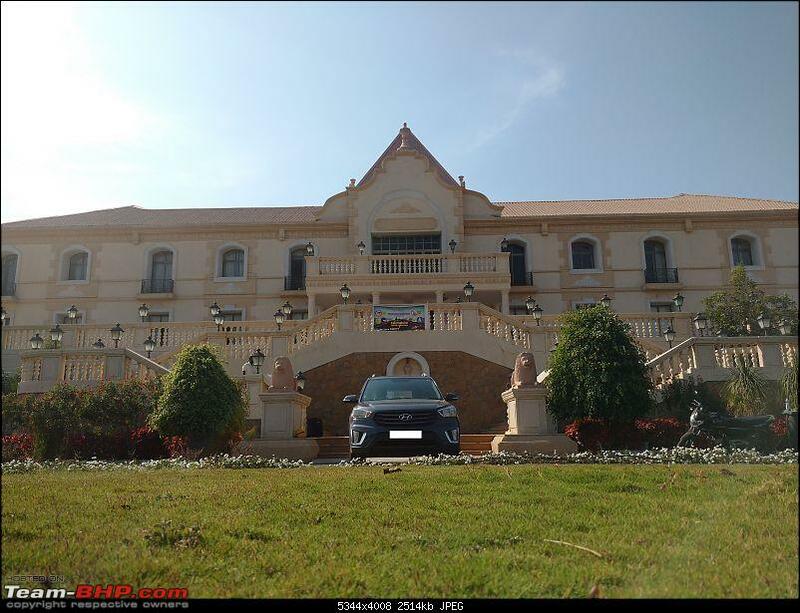 The car is now ready to be delivered and we choose the next day itself for delivery as there was no auspicious occasion in the coming days. The day prior to the delivery, I specifically ask my SA to avoid any stickers bearing the name and details of the sticker and he promptly agrees. First look of our new car! After a night of barely any sleep due to the excitement, we head to the showroom around 10-11 AM.We reach the showroom and I begin my work by checking the car for any possible scratches or dents which could have taken place during transit. Fortunately, nothing amiss and hence I go ahead with dad for the paperwork. A few minutes later, with all the paperwork complete, we move to the delivery bay where our new car is ready, gleaming in all her glory with a few ribbons on the doors. Customary photo taken and gift received, we take delivery of our new steed and head towards the nearest fuel station to fill diesel. The tank is given a stomach full of fuel, including the complimentary 5 litre fuel coupon given to us by the dealer. We later head to one of our favourite temples for the customary pooja following which the new member of our family finally comes home. wrong grille design. We had asked him for the chrome strips of the front grille which he said would be made available to us, instead he ended up ordering a single piece large chrome grille which was to be stuck over and above the standard grille. A bit too gaudy for our taste, we reject this grille and ask him to get what we asked for or just forget it. While me and dad went for lunch to a hotel nearby, the mechanics had fixed the fog lamps by slicing the original wires for the power connection. When i told my dad that we would end up losing warranty for the headlights/electricals, he gave a earful to the owner for having made such a mistake, specially since this wasn't the first one in the day. We finally got the car back by around 5 PM, with multiple accessories added including the chrome kit (chrome bits on the headlamp, tail light and fog lamp surrounds, rear reflector surrounds, door handles, panel above the number plate recess and windows), interior matting, seat covers, USB charger, AUX cable, fog lamps, Lamborghini style reflectors and rain visors. The dealer also gave us the gaudy chrome grille for free, but it was of no use to us and is still lying around somewhere at home. I probably might just put it in the giveaway thread after seeking my father's permission for the same. FYI, I had also inquired about these accessories at the dealer level, but most were unavailable and costed a bomb. The chrome kit that I mentioned above costs INR 25k alone, which is the total amount I paid for all the accessories as aftermarket units. Looks: I love the overall design of the car. 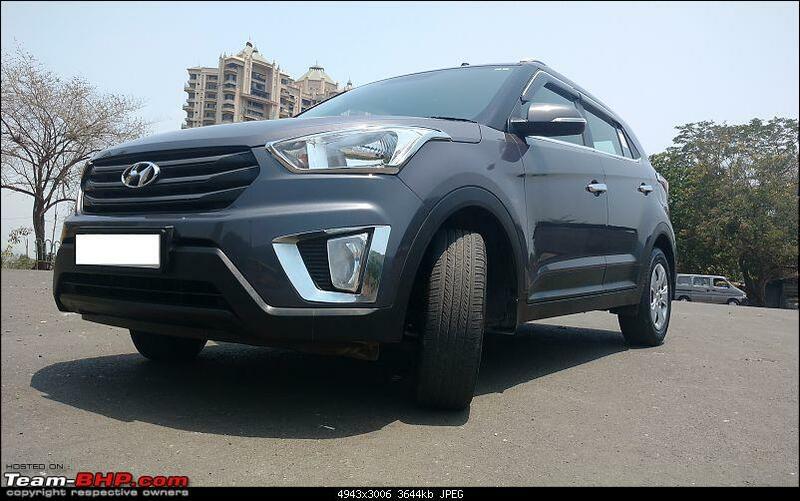 Although there are many Creta’s on the road, the number of people opting for the Stardust Grey colour are few (not the case with the facelift version though). Audio system: The system is a simple Double DIN or 2 DIN system and it is exactly what we wanted as me and my father don’t prefer the large, distracting (for me) touch-screen units. Boot space: Though not the best in class, the boot space of the Creta can swallow a lot of stuff and it has been helpful carrying unplanned luggage too. Lack of hood insulation: There is no insulation under the hood, which I feel would have helped contain the NVH levels from the engine bay. Lack of visibility at the rear: Due to the rather small size of the windshield at the rear, it is difficult to gauge the space while reversing and hence a rear view camera is necessary. No DTE: Missing Distance To Empty (DTE) and range parameters in the instrument cluster. Lack of illumination inside (the missing map light near the IRVM). 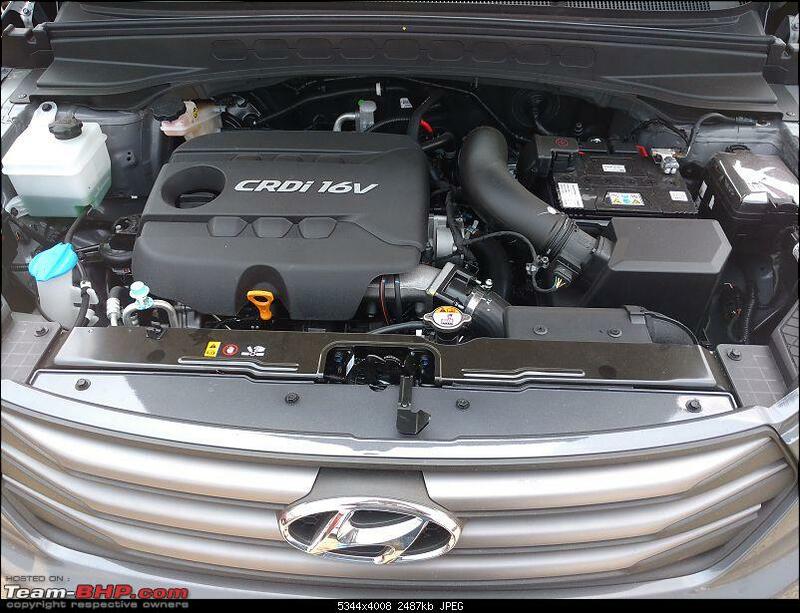 Although it is the base variant, Hyundai does offer dual airbags and ABS (with EBD?) as standard features across the line-up. The ABS, as a number of fellow Creta owners have expressed, feels a bit unsafe (probably not the correct term) as the brake pedal pushes your leg back thus giving a few stressful moments as I have experienced a few times. 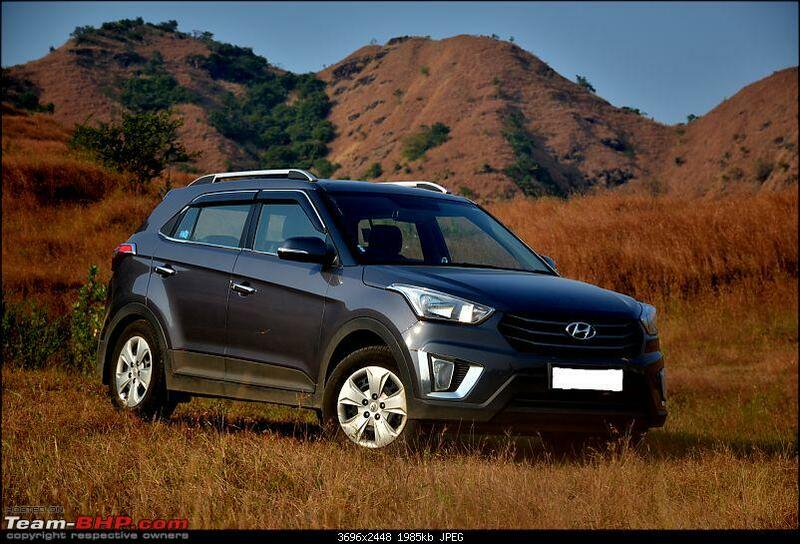 The Creta has currently clocked 98xx kms at the time of writing this review. 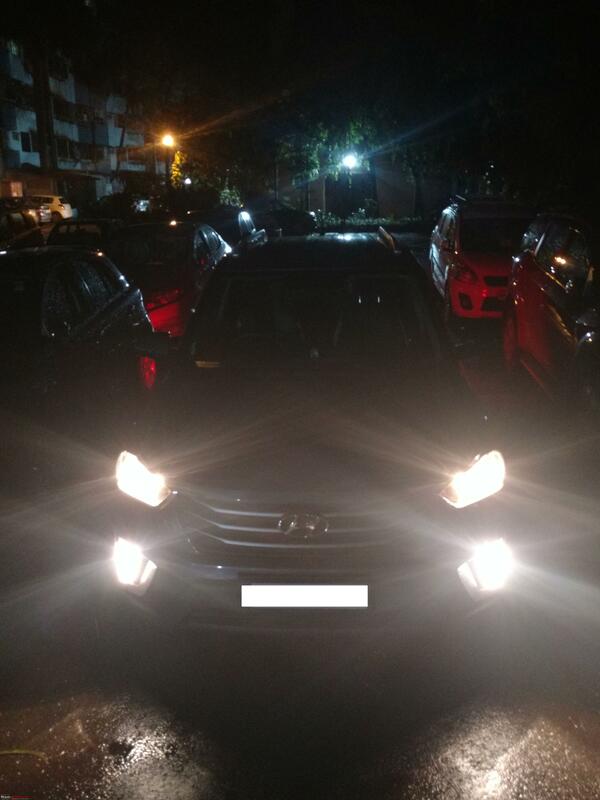 My Creta is used mainly on the weekends or for holidays/road trips and can hence clock anything between 100 kms to 1000 kms during a single trip. The car is sparingly used otherwise, most of them being trips to the airport/bus-stand to pick up a few relatives. The design of the car, according to me, is spot on; not too flashy nor too dull. The blacked out A and B-pillars add to the neat look of the car. The non-projector (halogen) headlamps and the missing DRL’s aren’t missed as much, although I would have loved to have LED tail lights or at least a few LED elements in them. The car feels sturdy in the build quality department and the fit and finish seems to be quite good too. The paint quality is exceptional and a simple shampoo was makes the car shine as though it was just delivered from the showroom. Pardon my lack of eye for details but I haven’t noticed any panel gaps till date. 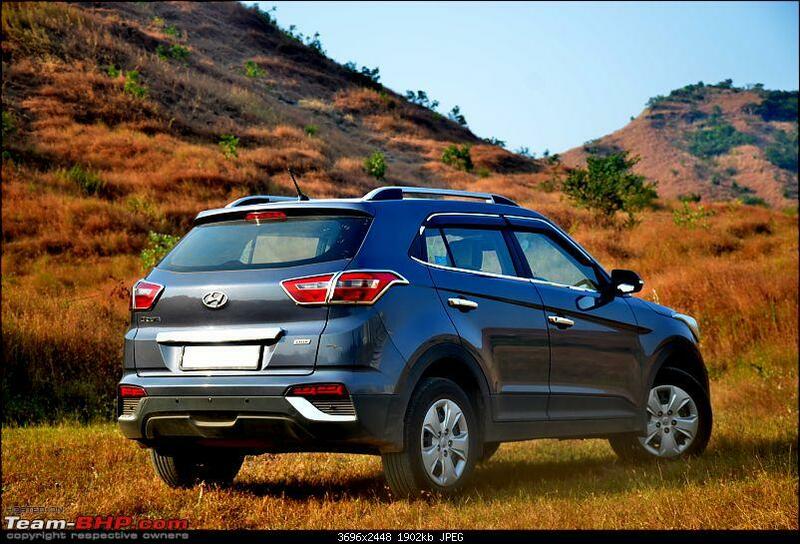 Hyundai has provided 16 inch steel wheels with decent looking wheel covers as standard. They look quite okay-ish although I do plan to upgrade them to alloys in the future. The tyres too are good and provide adequate grip. Coming to the interior design, I honestly dislike the beige part of the dual tone interiors. I would have preferred a single tone interior but unfortunately, you can’t pick such features you want in your car unlike a few other lucky people across the globe who have the convenience of the same. The overall build quality seems to be good although I am currently facing a few small niggles such as some insulation issue near the front passenger door and the rear left window getting jammed a few times. The material used in the boot above the spare wheel is of poor choice according to me as it gets quite some dirt and such elements stuck to it, which becomes a pain to clean. I cannot comment on the upholstery as I opted for seat covers soon after delivery. Space at the front seats is quite generous and the same applies to the rear seats as well. I’ve had a few friends saying that they’ve felt a bit cramped when there are 3 healthy people sitting in the second row, although I haven’t experienced the same as I usually sit ahead due to my heftier build. At the front, the seats feel quite comfortable and provide good support to the back and the legs. I do wish the headrest was a bit more forward biased though. The legroom at the front is wide enough unless you have a passenger at the rear that has a big built, and you have to pull your driver/front passenger seat ahead and end up with your knees fighting with the centre console. 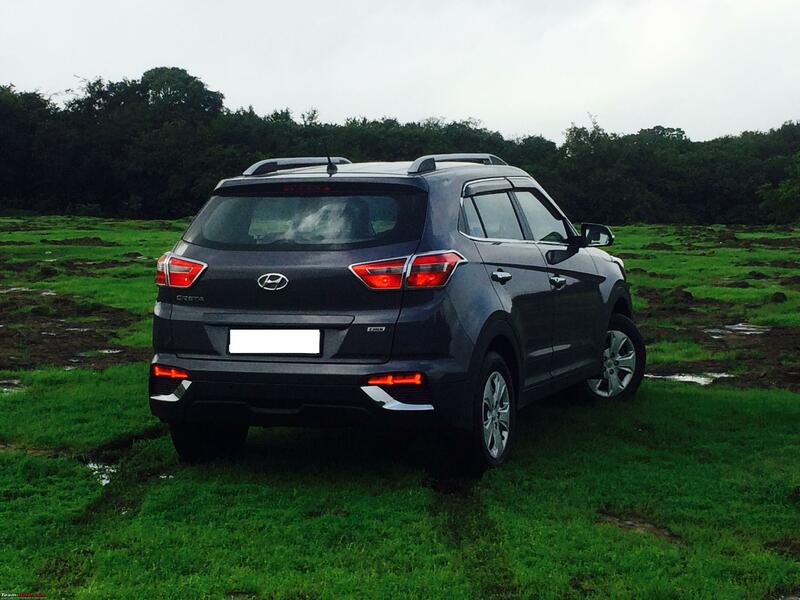 The driving seat in the Creta gives a very commanding view of the road. The large windshield on the front and slightly thinner A-pillar give a great view of the surrounding. The ergonomics are spot on although I sorely miss the height adjustable seat feature. The controls and stalks are appropriately designed and are within the reach of the hand. The MID displays a few details such as the average speed, odometer, two trip meters, fuel gauge and temperature gauge. The MID is quite bright and I’ve never had an issue with its visibility, be it day or night. The mirrors on the E+ Creta are electrically adjustable and offer a good view of the rear. That said, I do plan to install the auto folding function sometime later for the sake of convenience. I cannot comment on the stock IRVM as it has been replaced with a new unit which has an integrated view of the rear view camera. The air-conditioner in the Creta works very well. Me and my family members often keep the temperature a few notches above the maximum cool level and the blower is set to the 2nd setting when we begin the trip, while it is set to the 1st setting about 15 minutes later. I’ve used the heating feature too during the monsoons and while on a trip to Mahabaleshwar and it didn’t disappoint one bit. The E+ diesel variant of the Creta comes with a standard 2 DIN audio system (non-touchscreen) along with four speakers (one on each door). The sound quality has been satisfactory except for the past few days where I’ve started to feel the volume is low. I have a feeling it’s probably due to me using a new mobile (I always play songs through the AUX cable). 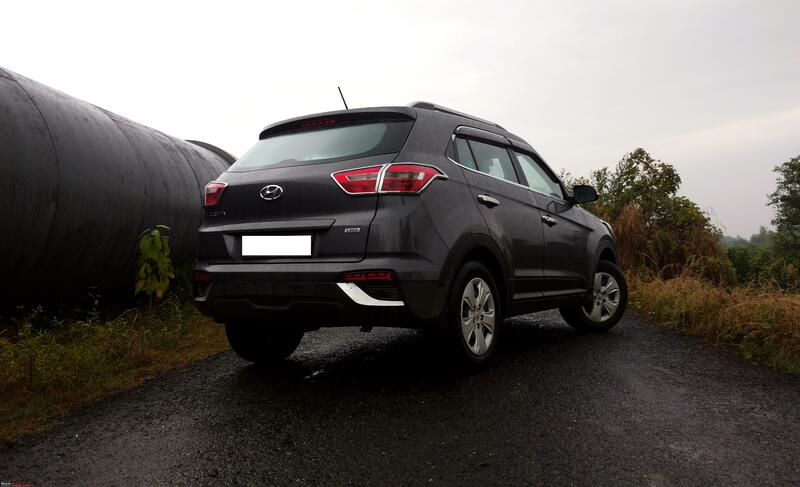 Utility wise, I am quite satisfied with the Creta, having moved luggage from one home to another in two trips. The Creta also satisfies the need for space if you have some unplanned baggage. During one such trip, we had three excess crates which were packed by shopping material apart from all our bags (3 small suitcases to be precise). Having driven the 1.4 Diesel variant of the Creta for over a year now, I feel the car is quite good, given my requirements. The engine doesn't feel underpowered to me as stated by a few other owners on various social media groups. In fact, this being the first diesel engine in the house, I have been enjoying the torque of this baby much more than I ideally should. The engine doesn’t feel stressed on highways even while doing triple digit speeds within the speed limits. The sixth gear helps the engine remain stress free until you start pushing her above the legal speed limits. The low end torque makes overtaking a breeze without having to change the gears during most occasions. 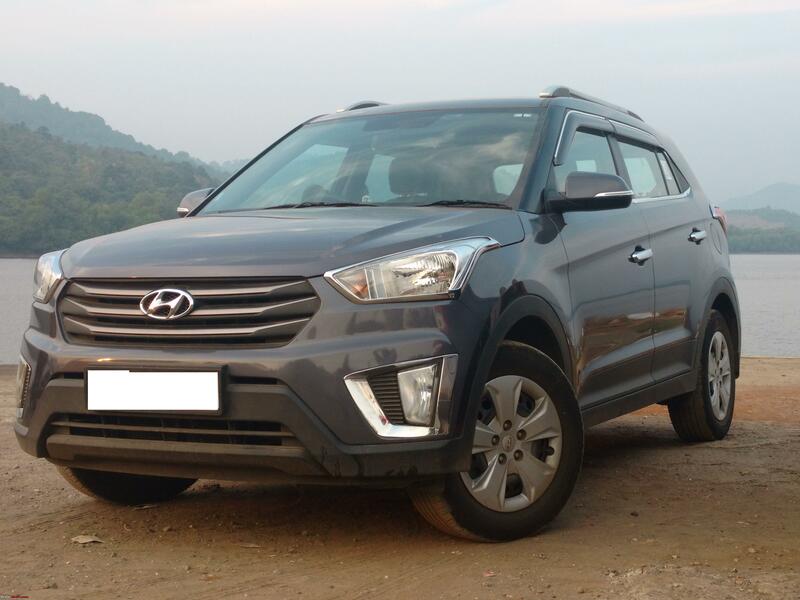 The 1.4 turbocharged diesel unit on the Creta is definitely an under-rated gem. 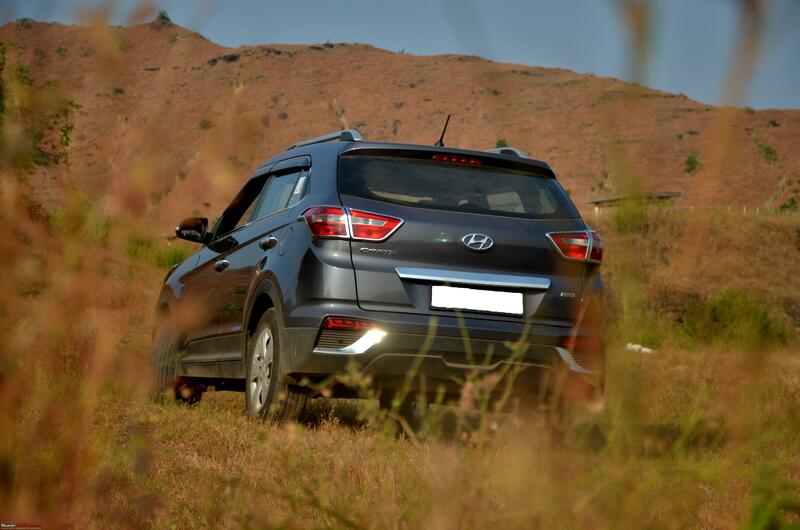 The engine never feels underpowered, has a lot of torque and returns a stellar fuel efficiency if driven sedately. That said, even under spirited driving, the fuel efficiency won’t leave you disappointed with a big hole in your pocket. 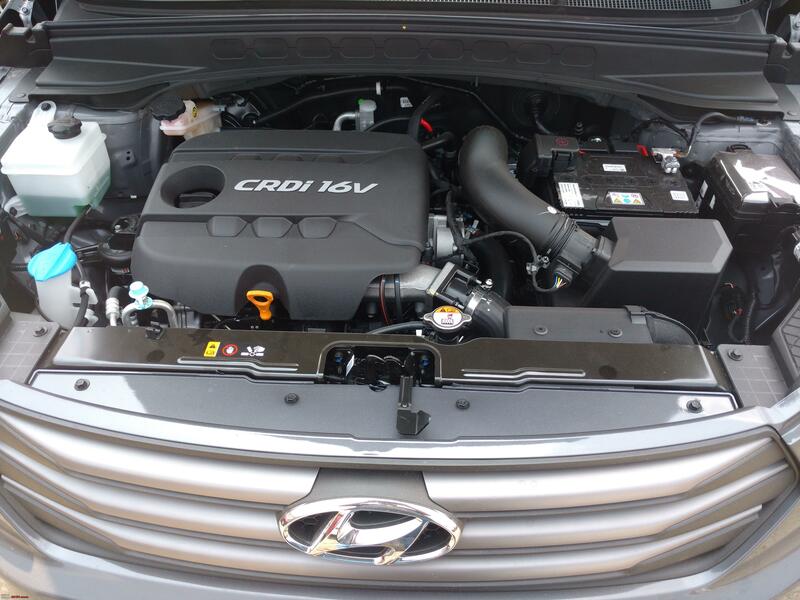 The NVH levels are quite satisfactory on the Creta. As you start the diesel engine, you can hear the typical diesel rumble, not so evident in the day due to ambient noise but very clear during the late nights. Wind noise in the car can be disturbing up to a point depending on the speed you’re travelling at. I usually roll down the windows only during the start of the trip or if there is some other need such as paying a toll or so, with the window being up the rest of the times the. Road noise is almost negligible. The biggest benefit of the 1.4L diesel engine is the fuel efficiency. The best and worst mileage recorded by me is 22 kmpl and 12 kmpl respectively. 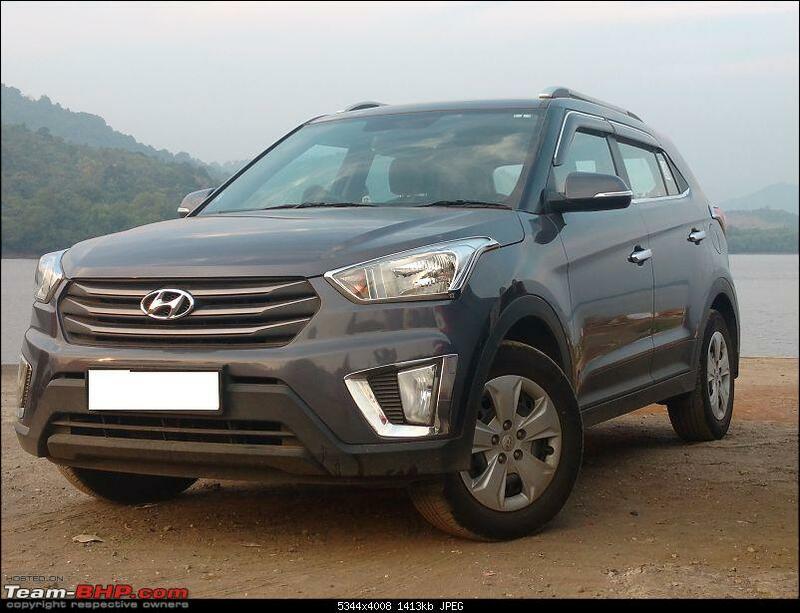 On an average, the Creta 1.4 should return about 15 kmpl in the city and about 18-20 kmpl on the highway depending upon the driving style. 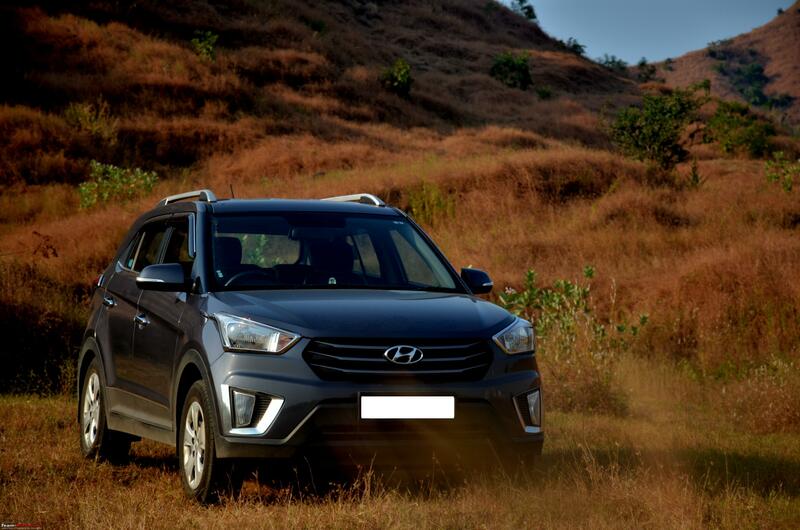 The suspension setup on the Creta does what it is intended to do. 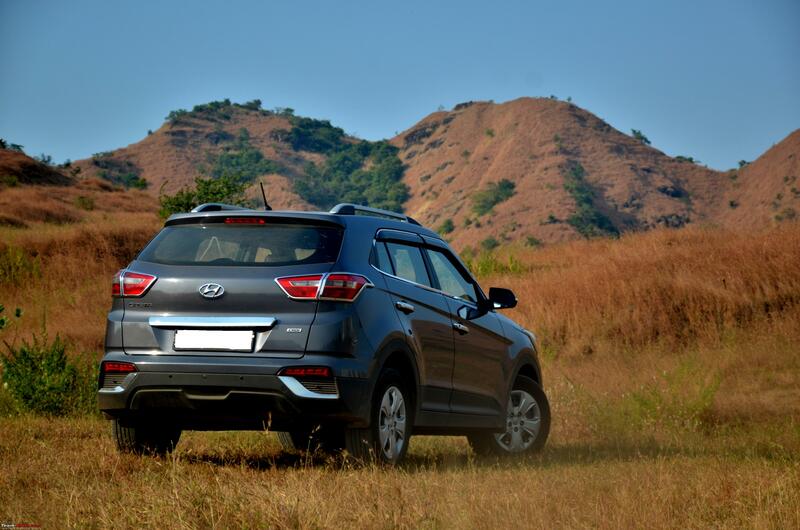 During soft-roading as well as potholes and the likes in the city and highway, it takes all the bumps in its stride. The ride quality doesn’t disappoint at all. The only negative point of such a suspension setup is the body roll which is felt at speeds in excess of 120 kmph. The car doesn’t feel grounded on such occasions and frankly, I don’t expect it to do so either as that it not what is has been made for. 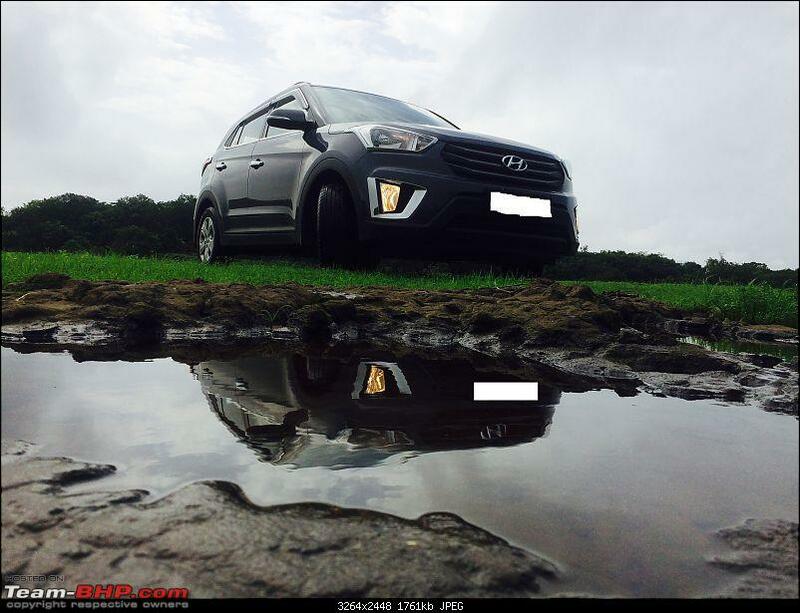 The ground clearance of the Creta is the best in it’s class, with the Nexon being the only exception (IIRC). 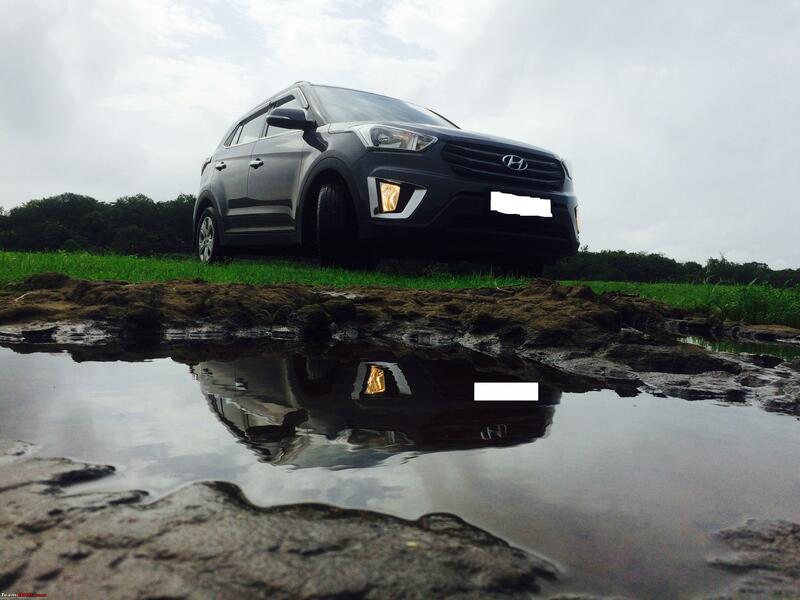 I have taken the Creta soft-roading on a few occasions and not once has the underbelly scraped or touched the ground. The higher ground clearance also helps tackling the unusually high speed breakers which are increasing with each passing day. 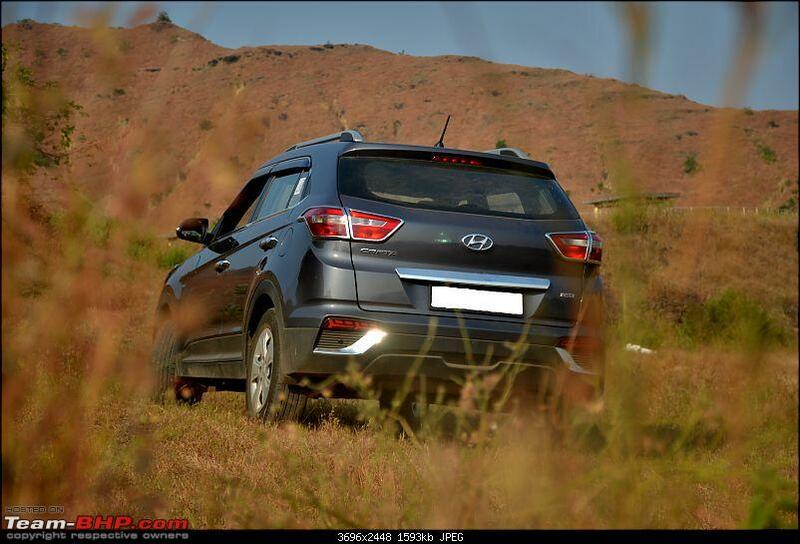 The first service mark for the Creta comes up in two months or 1200 kms, whichever is earlier. With a few trips to Pune, time for the first service was up in about a month. We called up the ASC and they offered to pick-up and drop the car which is not charged for during the first three free services. A few minor complaints were there and were duly addressed to. Total bill: INR 70 (charged for the wiper shampoo). 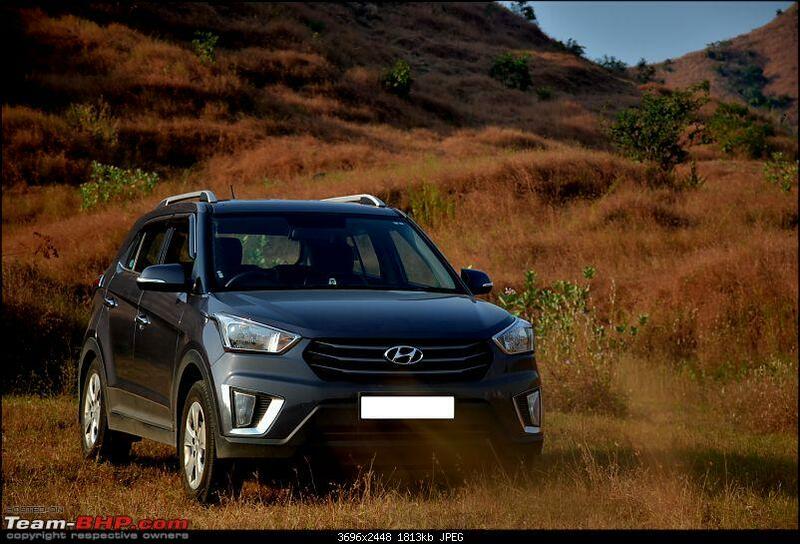 With my busy office schedule, the Creta had lapped up only 7xxx kms in one year when the second periodic service was due. This time, I thought of visiting the service centre and witnessing the process myself in order to understand things better. I called up Modi Hyundai on a Friday requesting for an early service appointment the next day. The receptionist asked me what time I would prefer dropping the car and I told her I would like to get the car there as soon as the ASC opens in order to avoid the weekend rush. 10-10:30 AM would be fine, I thought, but she told me we can give you an earlier appointment. I was guessing an appointment of 9:30 AM at the most, but was surprised when she told me I can come by 8 or 8:30 AM. I agree to come at 8:30 AM the next day. The following day. I reached there on time and was astonished to see the service advisor coming towards the car as soon as I drive in. Post a quick talk and sharing details, the SA takes the car to the bay and the job begins before 9 AM. He gives me an estimate of delivering the car by 1 PM and asks me whether I would like to come back later or wait for the car to be serviced so I can take it back with me. I choose the latter and he shows me the way to the customer lounge. Having been used to the boring Bajaj ASC where I used to get my Avenger serviced, I was in for a pleasant surprise as this customer lounge was actually good, replete with a working AC, glasses of water, newspapers and a TV with some music channel on (I know I'm comparing Apples to Oranges, but you get the gist). The service is completed by 11.30 AM, an update which is given to me by the SA while I read the newspaper sitting comfortably in the customer lounge. He says post the washing, I can pay the bill and take the car home, which I assume will not take more than 45 minutes (worst case scenario due to the weekend rush). An hour passes by and I begin to search for the SA who is nowhere in sight. I go towards the car and find it unwashed, waiting in queue. I request the guy managing the wash area to take my car in for a wash next since I've been waiting for more than an hour now. He politely obliges and the car is cleaned in 10 minutes. The car moves ahead for a final inspection of the job done. The guy responsible for the final inspection is a bit annoyed as the rubber beadings near the doors are not clean. The car is sent for a wash yet again and the whole was process (shampoo, wax etc) is repeated. Once again, the car is inspected and the guy assigned for the job points out to a few spots which are left out. He orders the car to be sent for a wash (yes, third time!). I request the guy not to send the car for a wash again just for the few spots which I can manage to remove on my own. I can't imagine the sheer waste of water and other resources that must be wasted each time such small issues are taken up. I agree that they try their best and it does end in better customer response, but at this cost, I'd rather get those marks off myself. Post the wash, the car is ready to be delivered, after the payment of the bill, that is. The SA takes me to the counter and explains all the details of the job card including the work done and the amount charged. I agree to all but one point, where he has put Indian Oil branded engine oil instead of Shell. Not that it was a life and death situation, but I was cheesed off at the fact that he refused to even ask me which oil I'd prefer. When I confronted him on the same, he said that Shell oil isn't available anywhere in the western part of the country and hence they use Indian Oil branded engine oil. 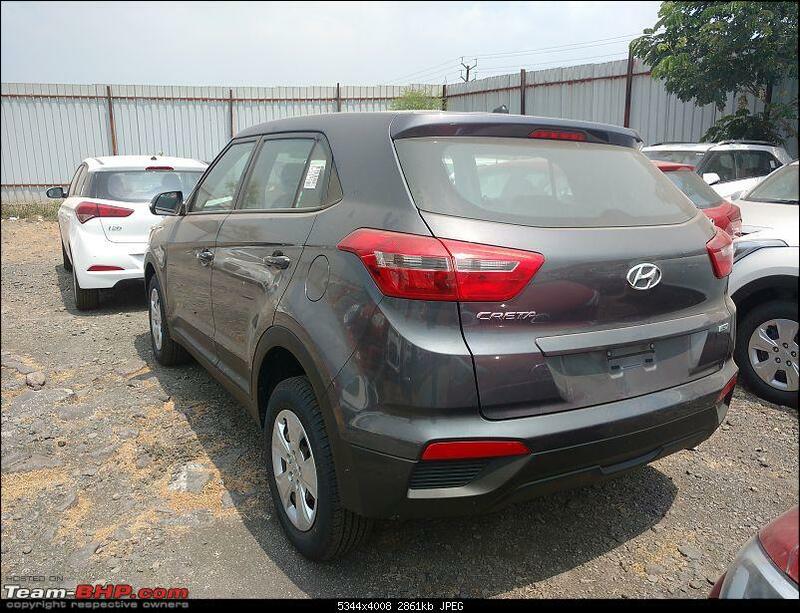 I ask him why it isn't available even though it is Hyundai recommended/approved oil for the Creta, to which he has no answer. I give up and go ahead with the formalities and fill the feedback form where I rate them 9/10. While his overall work was good and I was satisfied with the service, I did end up reducing one point for the lack of engine oil options available. Post the billing, two people come and ask me the reason for giving a star less and why I am not fully satisfied with the service to which I give them the same reason of the Shell engine oil not being available with them. They tell me to wait for two minutes as they convey the message to their higher-ups. They come back soon and ask me to meet the manager of the showroom who is sitting in his cabin behind the billing section. I go to his cabin and wait for five minutes as he finishes a call with another customer. He starts by telling me that everyone gives full marks for their service and if I don't, he will end up with a problem. Mind you, he doesn't even bother to begin by asking what my problem was. I tell him my reason for the rating and the fact that I strongly believe that 9/10 is still a good rating even after getting this type of service where I wasn't even offered or informed which oil would be put. He gives me the same reasoning that the SA had told me earlier, to which I ask him if I can get the same Shell engine oil from another store and give it to them to replace the engine oil during the next change. He refuses to accept this stating that warranty will be void if I purchase engine oil from outside. As I am already late to reach home and fed up by now, I give in to changing the rating as he refuses to budge without the same. After reaching home, I call up Hyundai India customer care to lodge a complaint of the same issue and they assure me that action will be taken. I receive a few phone calls the same week to confirm the issue but till date, I haven't received any update on the action taken (if any). Total cost of second service: INR 5577 (excluding wheel balancing and alignment). A week later, I got the wheel alignment and balancing done at a local shop at almost half the price quoted by the showroom. Total cost: INR 950. Since the time the Creta has joined the garage, a majority of it's usage has been on the highway and for a few holidays as well. The car is running just about fine for now. A few minor scratches have cropped up during parking/reversing which I plan to take care of when I send her for ceramic coating sometime next year. There have been a few issues with the aftermarket accessories such as the door sill lights failing to light up, water accumulating in one of the reflector lights and some error with the reverse camera. I plan to get these issues fixed soon as well. Please feel free to ask me anything related to my ownership report and this thread. 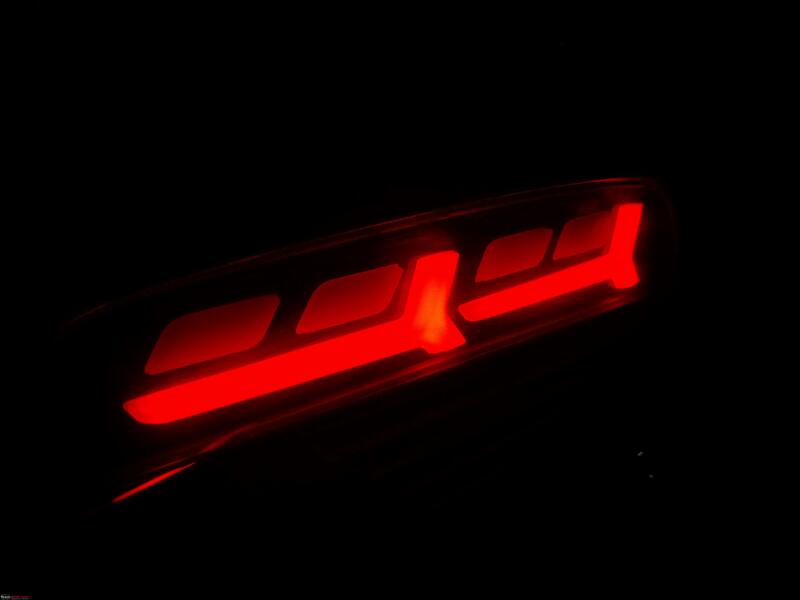 Teaser Alert: The Apache RR310 ownership thread is coming up next. Congratulations Sir and thank you for writing the report. Very less 1.4L E+ ownership reports on the forum. Keep the report updated as much as possible. Can be added, not an issue. But let me make you aware that there will be NO change in NVH levels after adding the hood insulation. I have the insulation in my car and I felt no difference in NVH. It is more cosmetic than functional. Here the link to insulation that I added in my Creta. Lack of visibility at the rear: Due to the rather small size of the windshield at the rear, it is difficult to gauge the space while reversing and hence a rearview camera is necessary. If the car has a 5" OEM head unit, then a camera can be added. Nothing much can be done with respect to DTE and Range data on MID or the lack of it. We'll need to live with it. Regarding the front map lights, it can be done. It is available on AliExpress. Shall post here when I can find the correct link. Another bad omission from Hyundai. It is a fairly costly modification to do if one wants. Excellent review. Recently drove a friends Creta 1.6 petrol Eplus the facelift version and didn’t find it to be barebones or stripped of essential features. 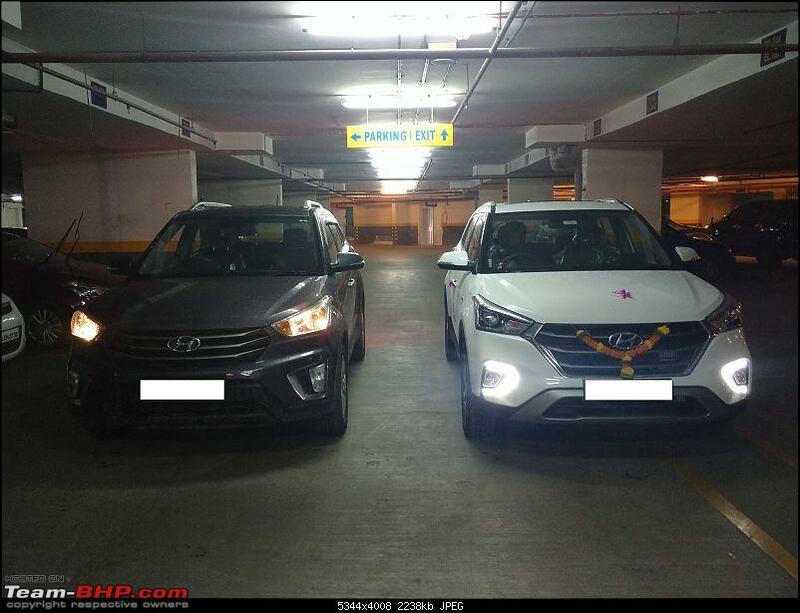 He has installed a lot of aftermarket accessories sold by his dealer including a the touchscreen HU from Blaupunkt which also serves as a screen for reverse camera. I did find the DTE feature to be present in the facelift version. To opt for the much cheaper facelift base version now makes more sense. Although the parcel tray is sorely missed. Great buy. Congratulations. How much do the lambo style lights cost? Does it involve fiddling with the wiring? If yes, then warranty? All 4 windows come with one touch up down or only driver side? Great review @Torque_curve. 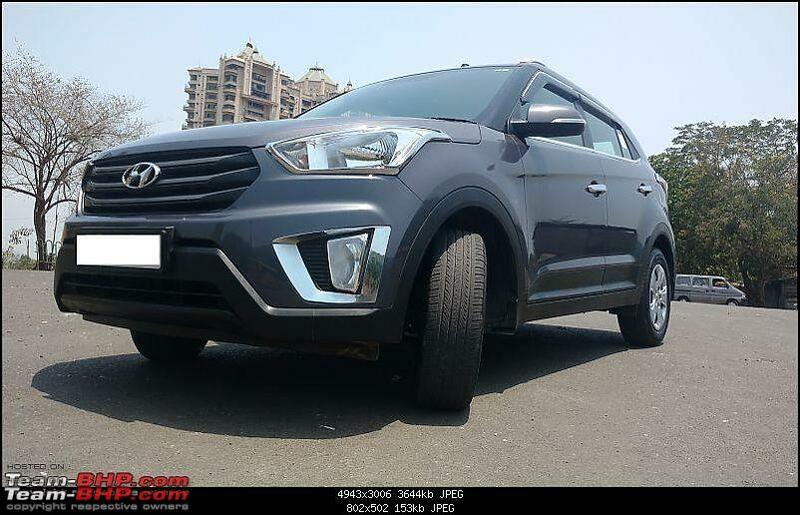 As another BHPian has already mentioned, it's rare to find reviews of the Creta 1.4 Diesel, having this detailed review would help a lot of potential buyers. Pardon me if I missed your reasoning, but considering your usage, why did you opt for 1.4 Diesel instead of Petrol? The petrol model does have better grunt. Is it because of the similar pricing? 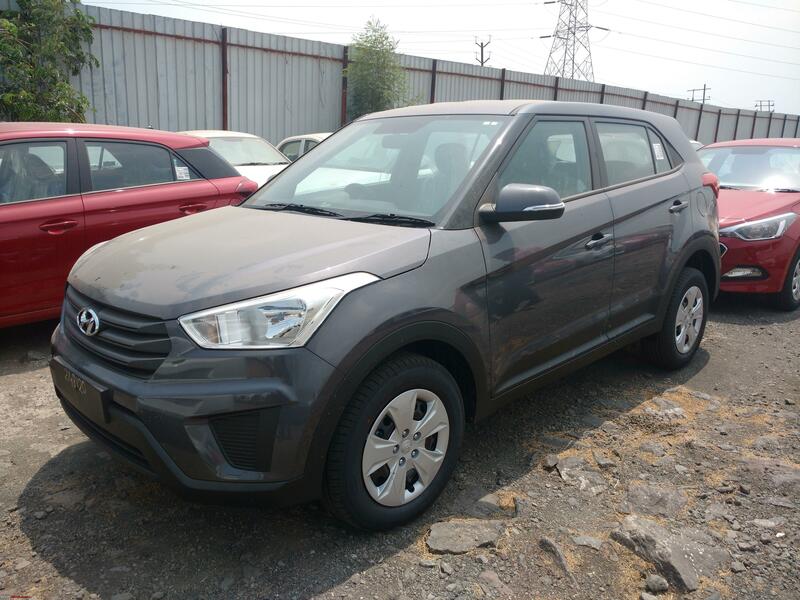 Overall I feel Creta is a great car, except for the strange variant decisions by Hyundai, it's well packaged and overall a pretty comfortable vehicle which gives the driver a good stance while driving. My only gripe is probably the not so stable rear end of the vehicle at speeds around 120, something which is present even in our 3rd gen Honda City. This behaviour is evident especially on bridge connectors and sudden road undulations. I wish you a fuss-free future ownership! No ‘Sir’ please. I’m just another fellow member on the forum. I do remember reading your thread after asking you about the same when you had shared the insulation update in one of the Creta Owners Facebook group. I would want to put the insulation more for the difference in the NVH level than the cosmetic difference. Not that the current NVH levels are an issue, but it’s just that I would have liked less noise from the engine inside the cabin. The car doesn't come with a touchscreen unit. It is a 2-DIN system and hence I have replaced the stock IRVM with a rear camera view integrated unit. I will be looking forward to the link for the map lights. It would be helpful to quite an extent based on my usage. Yes I totally agree with you. Hyundai and their feature list/omissions are a mystery by themselves. Thank you for your kind words. When I was considering the Creta, the two distinguishing features that I specifically remember between the E+ Petrol and Diesel were the roof rails and touchscreen unit which were present in the former but missing in the latter. 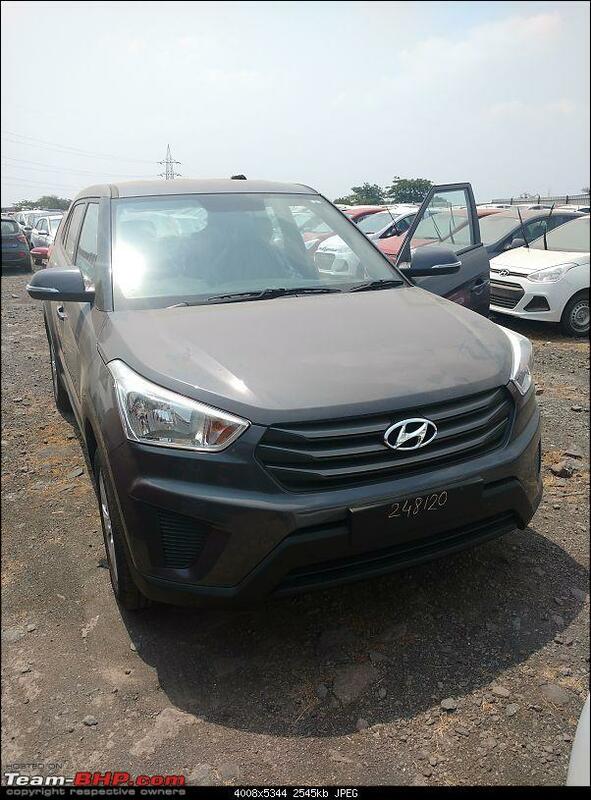 Yes, Hyundai seems to have addressed a few missing features in the facelift version such as the DTE in all variants and sunroof in the top-end variants. As A4anurag mentioned, the parcel tray can be fitted but is an expensive proposition. 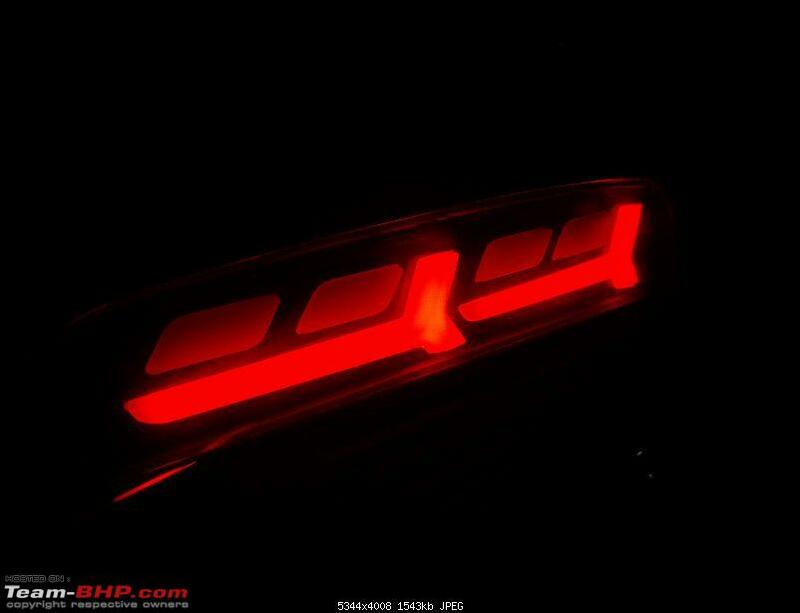 The Lambo style lights cost about INR 2000-2700 a pair based on where you buy it from. There are local dealers selling these but you can get them from AliExpress too, which is likely to be the same place from where these dealers are sourcing them. I paid approximately INR 2500 but learned about the AliExpress route only later. Frankly, it won't make a difference from where you buy as neither of them are going to give you any warranty. I'm not entirely sure if they sliced through the original wires, but I remember a few dealers in the Creta Owners Facebook groups saying it can be fitted without voiding warranty. Regarding the windows, none of them are one touch up or down, not even the driver side. Thank you for the compliment. The review is only a small way of me saying thanks and giving back to the community and it's members from which I have learnt so much. 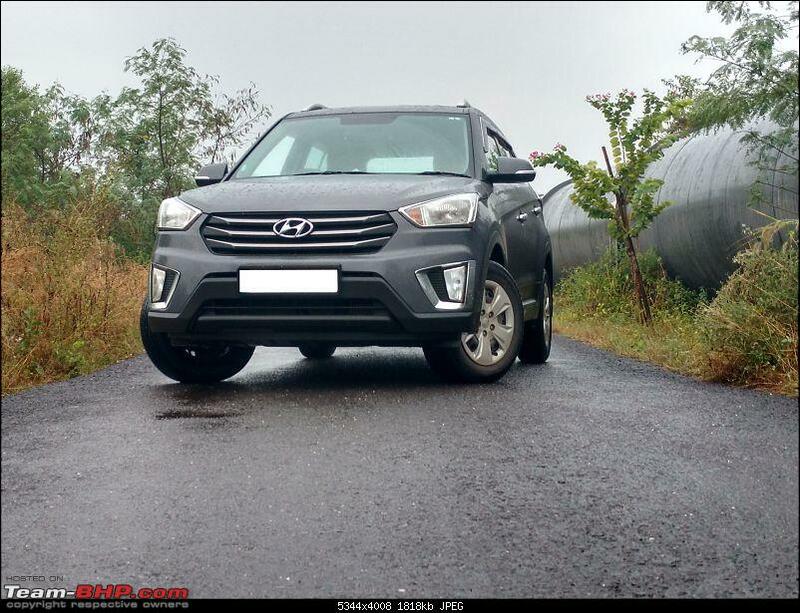 We had initially planned to do a lot of road-trips across the country and hence needed a fuel-efficient motor for the same. But due to unforeseen health issues in the family, we haven't been able to go ahead as planned. 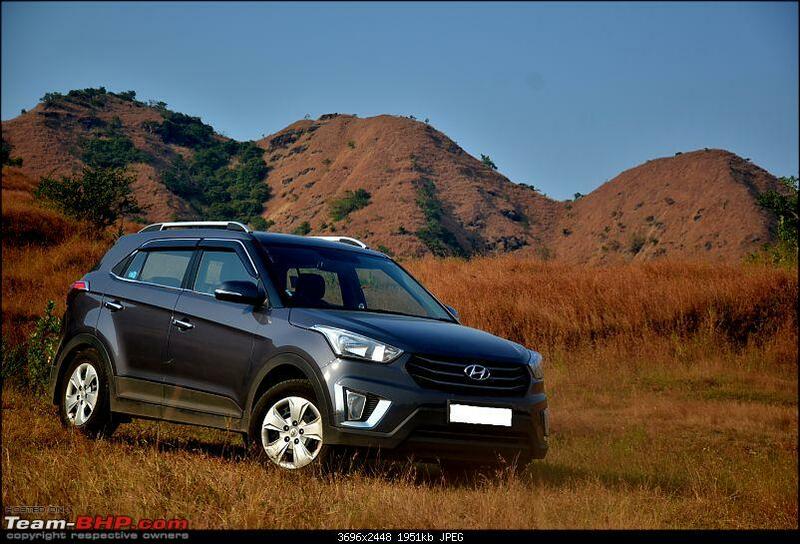 Agreed, the high speed stability is an issue with the Creta not just at the rear but with the vehicle as a whole, but then again, this is not something I feel it was built for. I guess it does the job it is meant to do, which is handle rough roads, give a comfortable drive and with the 1.4 diesel mill, a great fuel efficiency too. True. As long as the car fulfils its purpose, all is good. The satisfaction of owning a fuss free car is such a boon. Given how well this car is selling, it certainly must be doing things really well to keep the customers hooked. One of a rarity ! But once it fits your requirements, nothing is a rarity anymore! And like you said a question of over or underpower is at some point dependent on how we drive. As long as the car is tractable in the city and has decent pulling power on the higher for a constant 3-digit cruise, it should be good for many folks. Congrats and all the best for many more miles. I go to his cabin and wait for five minutes as he finishes a call with another customer. He starts by telling me that everyone gives full marks for their service and if I don't, he will end up with a problem. I face this too, every single time. This is a huge huge huge annoyance. 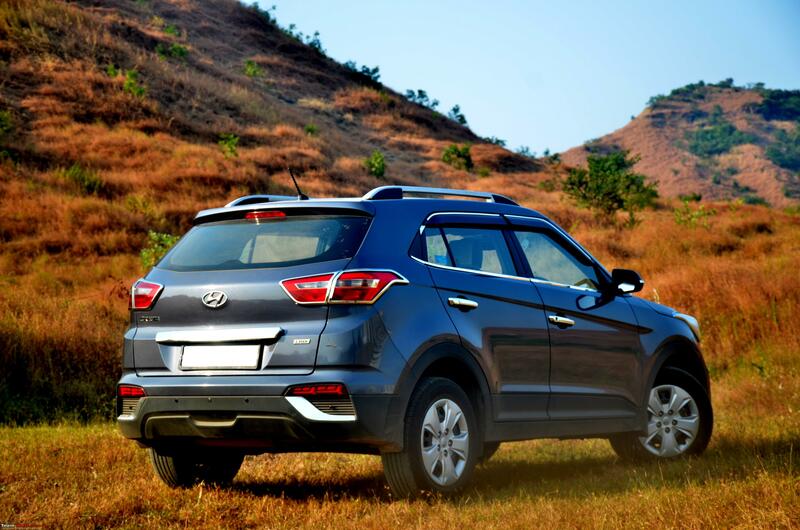 As per Hyundai, ratings 1-7 is poor, 8 is good, 9 is excellent, and 10 is outstanding. 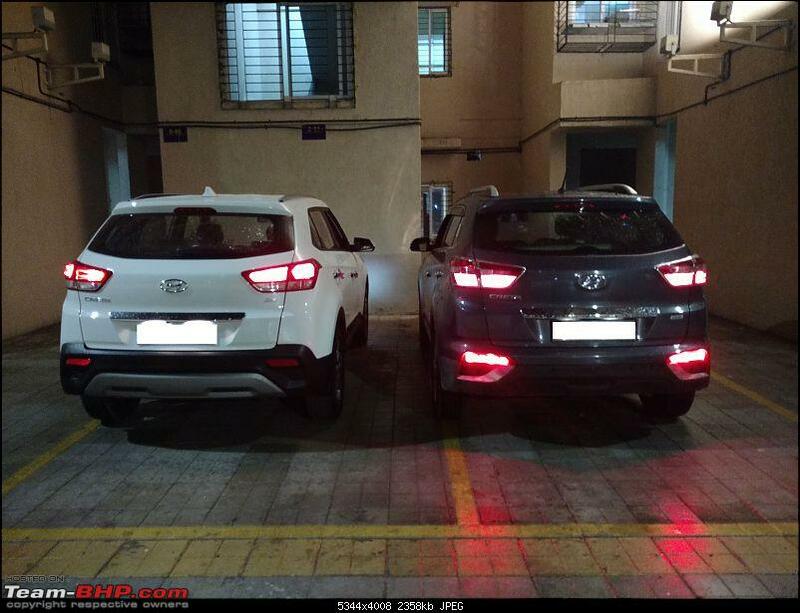 The dealer says that Hyundai will penalize them if rating is not 10! I don't even know if this is really true. Hyundai making suggestions to the dealer for improvements is a different thing, but if they are penalizing the dealer for a "9" rating, then it is ridiculous. I generally tell them that I gave them an overall "9" because there is always scope for improvement. For example, you can always improve the waiting area, always improve the dealings with the SA, always improve your billing experience, always improve on cleaning, etc. On top of that, they insist that I fill in the ratings on the feedback card right then and there, when I pay the bill for the service. Now, how the hell can I rate them for various points when I haven't even received or driven the car? As an example, the entry to a Hyundai service on Bannerghatta Road is a mess due to the metro construction, and I had to collect my car from a narrow muddy side gully. So I gave them a "5" rating for the "How was the approach/location/delivery experience?" kind of question the last time. They made a huge hue and cry even for this! I told the SA that though I did not personally have any issues with him, the dealer (his bosses) should fix this problem, as it was a valid issue (probably shift out? Have an alternative entry gate?). I've never had any issues with either my car or my service station. They have been excellent in general. But this feedback/rating system drives me nuts. Last edited by PearlJam : 3rd December 2018 at 11:10. Thank you for the compliments. I had written a fairly small review but thanks to GTO and the mods team, I could expand it with a number of pointers that were shared by them. I totally agree that their rating scale is flawed. For all we know, they might be using these scales which would help reflect that the company receives X% of customers who give 9/10 and 10/10 ratings which in turn could get them a better ranking in customer surveys such as the JD Power survey. Exactly! Even I had retained a star for the fact that the oil I wanted wasn't available due to whatever reasons they might give. It's their problem if they aren't able to store the Hyundai recommended oil, not mine. Me, or as a matter of fact, any customer; has the full rights to give the ratings based on the service we have received. They cannot push us for a 10/10 rating. I'm not taking this attitude henceforth and will see to it that I give them the rating based on the services provided by them. I have asked them to order the preferred engine oil for the next oil change that should take place sometime in mid-2019. I'l keep the thread updated about the same at the given time. This is something which even I have been through during the second service. While there was no need for me to take a test drive as it was just the second free service, I did ask him to show me the new engine oil that was put with the help of the dipstick. I know this trick of theirs from the time I've begun witnessing servicing of my vehicles and hence, never leave an empty column, not even the detailed feedback section. I doubt they even care about all these problems at the service centre as long as they are getting their bogus 10/10 ratings. A nice review for a very nice car!! 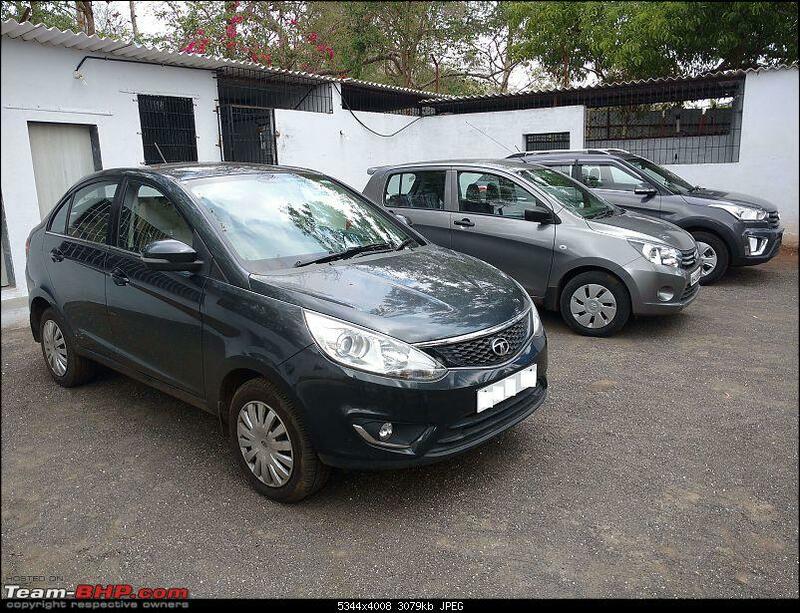 Thanks for putting this up, as the base 1.4 variants of the Creta and the Verna are ususally given a miss by most reviewers online. Even TBHP's official reviews rarely cover the lower engine options and variants. The Brezza was chucked from the list post this worthless effort. I had similar experiences with the Brezza, as it was almost impossible to get a test drive. 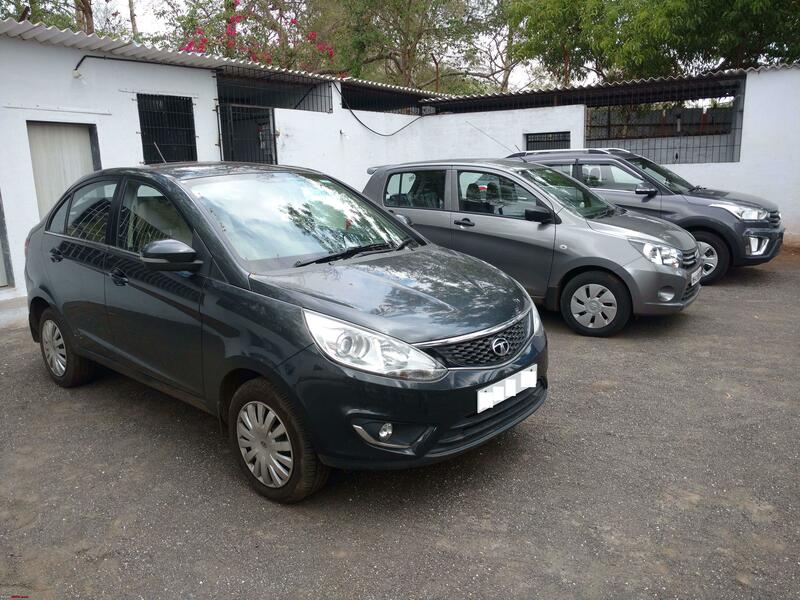 As with all Maruti cars, most people just booked it without demanding a test drive, and with all the bookings in hand the staff were getting uppity when we asked for test drives, and mostly had a "take it or leave it" attitude. It was the same case for me, but I had a friend at the showroom who managed to arrange a long TD for me. Ford EcoSport: After checking out the display vehicle, the SA shared the spec sheet and the price list with us, with even the base variant of the model seeming to be a stretch for our budget. Another down-side (a big negative point for my dad) was the side-way opening tail-gate which could occasionally pose a problem while loading and unloading stuff from the boot due to space crunch in my society. Now this I find weird, because the base variant of the Ecosport started at about 8 Lacs OTR at the time, and the Titanium Diesel model that I bought in 2016 cost me 10.29 lacs OTR after discounts. 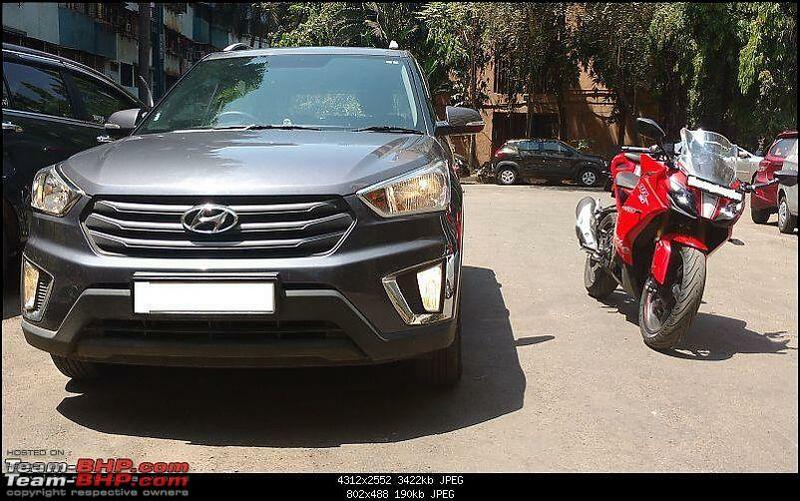 I chose it over the Creta because the Creta 1.4 was missing out on so many features while priced the same as the Ecosport Titanium which had a bigger engine, Airbags, Alloy wheels, climate control, seat height adjust, lumbar support adjust, Fog lamps, the Sync Audio system, and at the time, I calculated that I would have to spend about 1.5 lacs in accessories to bring up the Creta to the level of the Ecosport Titanium. Also, I find the sideways opening tailgate to be more useful than the regular hatch, especially if there isn't much room at the rear to open the door fully. In the case of the hatch, if there isn't much room (say 1 feet) behind the car, if you open it partially, the opening is at the bottom. But in the case of the sideways opening door, you can open it a bit and put your shopping inside through the gap. Renault Duster:...the bare-bone and dull interiors (no offense to any Duster owners whatsoever) were a big put-off. Add to the fact that the company's sales and service was a hit or miss (at least in my area), sealed the fate that the Duster definitely wouldn't be coming home. As I recall, the Duster RXE was priced the same as the Creta 1.4. The main reason I didn't finalise it was the lack of airbags, and because the Ecosport's killer pricing and features. I agree about the spartan interiors (but they remain the same over age), and the hit or miss service. I remember that the ride was awesome, and so was the interior space and boot. The engine was also very smooth, and it was the easiest to drive, with no lag at all, and enough power. The deal is sealed and we book the car against an amount of INR 5000. That's quite a negotiation!! Kudos! I was not able to get any discounts from the Hyundai dealer here, as they were saying they didn't have the 1.4 in stock and would have to order it. There was also a waiting period. I like the accessories that you have got, especially the LED reflector strip. I am having a hard time finding something like that for the Ecosport. Last edited by vivekgk : 5th December 2018 at 08:35.